Conspirare, a Grammy- nominated chamber choir, will sing in Sauder Concert Hall at 7:30 p.m. on Tuesday, Oct. 5. The group will also record a new album in Sauder, with the well-known classical recording label Harmonia Mundi, during their visit. Having heard about Sauder’s exceptional acoustics, Conspirare decided to record in Sauder even before Goshen’s Performing Arts Series committee asked them to perform. It worked out perfectly that they would combine concert with recording in a three-day visit to Goshen this October. In Latin, “conspirare” means “to breathe together.” In one unified breath, this group of 36 professional singers from across the country blends classic with contemporary, secular with sacred. Conspirare was founded by the conductor Craig Hella Johnson in Austin, Texas in 1991. Since then, the group has released three albums: “Through the Green Fuse” (2004), “Requiem” (2006) and “Threshold of Night” (2008). 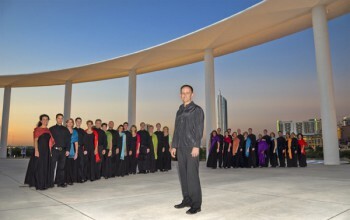 “Requiem” and “Threshold of Night” each received two Grammy nominations for Best Choral Performance and Best Classical Album, and “Requiem” won the 2010 Edison Award (the Dutch equivalent of the Grammy) in the Choral Music division. “The ensemble is considered by many to be one of the finest professional choirs in the country,” said Brian Wiebe, music center director. Conspirare will sing a number of spirituals at the concert on Tuesday, tracing American history through music. Johnson is renowned for blending different elements of music in an aural collage, and the program in Sauder promises to combine lively with contemplative. Johnson will also be working with some singing students during one of Conspirare’s afternoon recording sessions. Over 300 seats are still available for the Conspirare concert this Tuesday. Tickets are $20, $40 and $45, depending on their location in Sauder. To reserve a ticket, call the Welcome Center at (574) 535-7566. To learn more about Conspirare, visit them online at www.conspirare.org.